Gabi Shapiro stands thoughtfully over his upright bass, head down and bow in hand, in front of a sparse but attentive crowd on a recent Tuesday evening at Dobrá Tea. He raises the bow and strikes the instrument’s strings, unleashing delicate and exotic phrases. There’s a pause at the conclusion of his lengthy solo. Behind him, an older man dressed head to toe in black smiles and nods, a violin at his shoulder. “Good one, Gabi,” he cheers with the trace of a foreign accent. On cue, the quartet launches into a fiery Middle Eastern reel as two violins commandeer Shapiro’s melody, propelled by a nimble flush of hand-drum beats. Shapiro, now plucking his strings by hand, holds down the low end with a rumbling, energetic bass line. The tiny tearoom is filled with a hypnotic swirl of sound. The band is Grup Anwar, or, more formally, Anwar Ensemble, a new group led by Anwar Diab Agha. The 72-year-old is a master oud and violin player and a famed musician and composer in his native Syria. Before moving to the United States permanently in 2008 to be closer to his children — who had immigrated here over the previous couple of decades — Agha was a member of the Syria National Radio and Television Orchestra in Damascus. He studied under the masters of traditional Arabic music, and has traveled the world as a highly respected Arabic master himself. Agha has played for thousands at major venues around the globe. Tonight, however, as part of his weekly residency at Dobrá, he’s introducing a half-dozen Burlingtonians to the alluring, foreign sounds of Arabic Maqam. On Saturday, June 23, Anwar Ensemble will give their first formal concert at the Off Center for the Dramatic Arts in Burlington. Anwar Ensemble were founded in 2011 after local clarinetist Jeff Davis met Agha at a Radio Bean open mic following a practice with Davis’ own band, Lokum, a Turkish-influenced ensemble that also includes Shapiro. 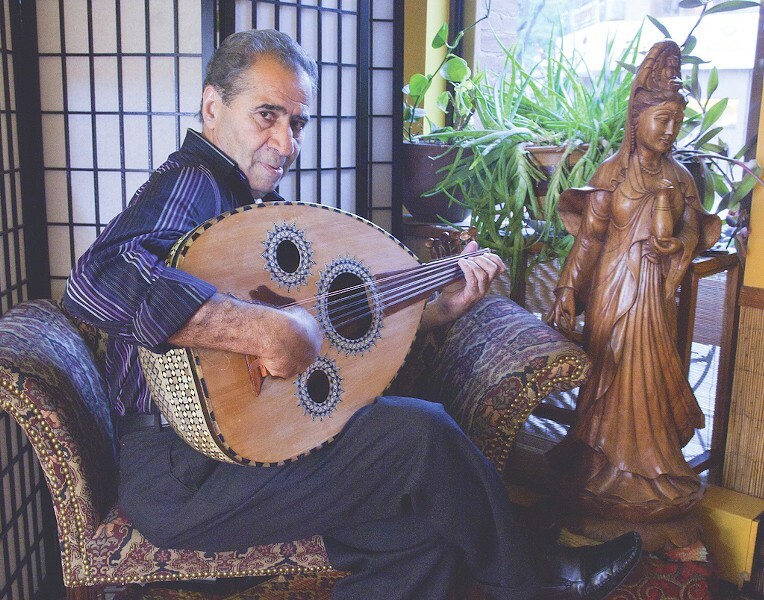 “We had heard there was this master oud player who would be performing, so we had to go and check it out,” Davis recalls, noting the dearth of Middle Eastern players in Burlington. Davis, who had been studying Arabic music with teachers in Montréal, was specifically seeking an oud instructor when he heard about Agha. “We were blown away,” he says of the latter’s open-mic set. Davis began taking lessons from Agha, learning to play the gourd-like lute, as well as absorbing the intricacies of Maqam, a traditional Arabic modal style noted for its use of quarter tones and deceptive phrasing. Western musical modes are generally based on half tones. The use of quarter tones, or “in-between” notes, gives Maqam an exotic flavor that is similar to — and was influenced by — the music of central Asia, Moorish Spain and the Ottoman Empire. Maqam is centered on melodic structures and is often characterized by an absence of harmony. In Anwar Ensemble, violin, oud and even double bass might play the melody simultaneously. As Davis explains, the music’s complexities are built not through harmony, as is common in Western music, but through the contrasts in timbre among the instruments, from the rich bass and violin tones to the muted, almost nonresonant thrum of the oud. Davis says Agha composes in traditional Arabic styles that date back centuries but grew in popularity in the 1930s through the 1950s, when Agha was a young man. “We play in what you would call a classical Arabic form,” Davis explains. That form encompasses several substyles, including muwashshah, a poetic vocal style; bashraf; sama’i; and an entirely instrumental form called longa. “There is a significant Ottoman influence in classical Arabic music,” Davis continues. He says that while Agha most often composes in the sama’i and longa styles, he also writes in the Arabic folkloric style. Where longa and sama’i share functional similarities with Western classical forms such as chamber music, the folkloric style is more akin to Western folk and dance music. Davis says that, like many contemporary Arabic composers, Agha will often fuse Western influences with traditional Arabic forms, writing in the major or minor scales to which Western ears are accustomed. Anwar Ensemble now consist of Agha, Davis and Shapiro, as well as violinist Greg Allison and percussionist Colin Henkel on darbuka. The band also occasionally includes violinist and luthier Joe Cleary, local marimbist Jane Boxall on riq, Peter Bingham on oud, Jamie Levis on darbuka, and Channon Bernstein on daf. Agha’s English is poor, which can make communication with his new bandmates difficult. Shapiro says their bandleader is demanding but also very patient. Speaking through his son, Samer, with whom he moved to Vermont from Brooklyn in 2010, Agha says the musical intelligence of his band members helps foster understanding. “Western musicians have really nice minds,” he says. Agha adds that he’s had oud students who take years to learn what Davis has mastered in months. Anwar means luminous in Arabic, and the word is a fitting description of Agha’s general demeanor. He’s quietly reluctant to speak on the current political and social strife in his native Syria, but he brightens up as he muses on the unifying power of music. He also beams when he talks about his adopted state. Agha has composed several pieces inspired by the Green Mountains. They include an instrumental song, “Longa Vermont,” and “Susannah,” which may or may not be an ode to a woman who works at Dobrá. “We’re not entirely sure who that one is for,” says Davis, chuckling. He adds that Arabic composers often name their compositions after women as a sign of respect and admiration. “I guess some things really are international,” Davis concludes. 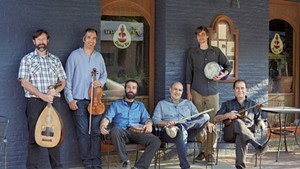 Anwar Ensemble perform this Saturday, June 23, at the Off Center for the Dramatic Arts in Burlington, 8 p.m. $10. Their Tuesday night residency at Dobrá Tea is ongoing.